The Western Digital (WDC) My Passport for Mac has a very simple 'notebook' design which it takes from Western Digital's own larger My Book series. With a dark-grey outer casing and a silver 'pages' trim around three sides, it certainly has an understated but elegant design. The plastic used throughout the device feels solid to the touch and, while it's not as robust as some ruggedised drives, we felt it was certainly tougher and more robust to the touch than most consumer devices. When it comes to connectivity options, you'll find a single USB 2.0 port with a small LED light that shines when the unit is connected and in operation. As you would expect, the disk inside is a Western Digital 2.5-inch laptop hard drive which comes with an 8MB buffer and Serial ATA (SATA) interface. When it came to testing this drive, we found it to be fast, offering transfer rates only slightly slower than the Verbatim Portable Hard Drive, which was one of the fastest devices we have tested. The unit we tested was designed specifically for Mac users, but there is also a Windows-only version available. 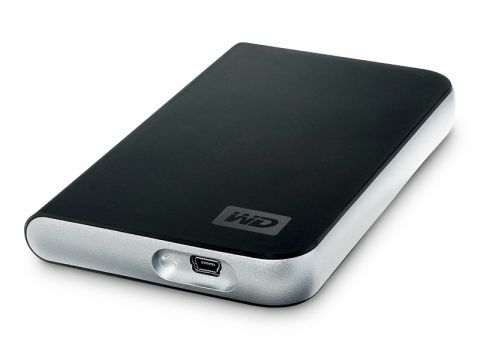 With a standard 500GB capacity, you'll be able to store 220 hours of video or 160,000 photos. You won't find any software bundled with this drive, but when you install it with your Apple Mac laptop or desktop PC, it can be immediately set up to run with Apple's Time Machine back-up software to mirror the contents of your laptop's entire hard drive whenever you connect the device. Very much like the Seagate FreeAgent Go, the Western Digital My Passport for Mac manages to offer a great deal of storage space in a very small and compact design. Sure, it lacks integrated back-up software and we would have also liked to have seen password protection and data encryption options added. However, with such a decent price and fast data transfer rate, this is a neat and highly usable portable drive and very well suited to the casual mobile Apple user.